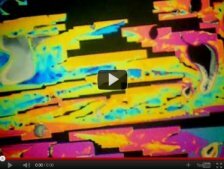 Crystal Growth Videos: Polarized Light Microscopy. 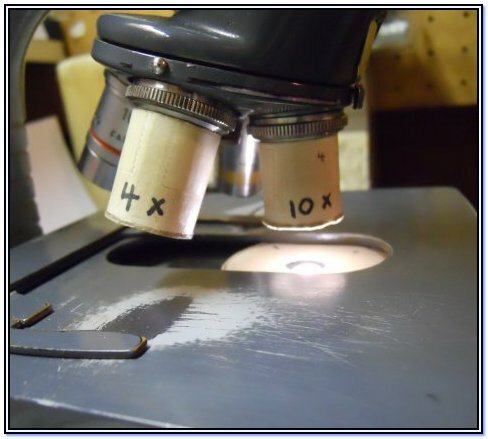 This article features videomicrography of crystal growth captured with an AO binocular microscope equipped with polarizing filters and a homemade camera mount. When I saw the beauty in the early footage I decided to put the videos to music. At that point it moved from capturing science videos to making artistic mood pieces using science as it's base. The following describes how I started on this path and some of the steps to the finished version. 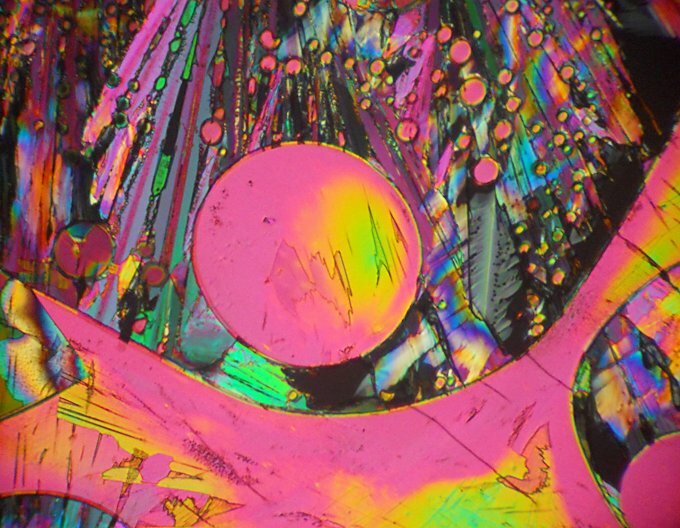 Years ago I pursued the hobby of film microphotography and had taken many Kodachrome slide images of crystals under polarized light. 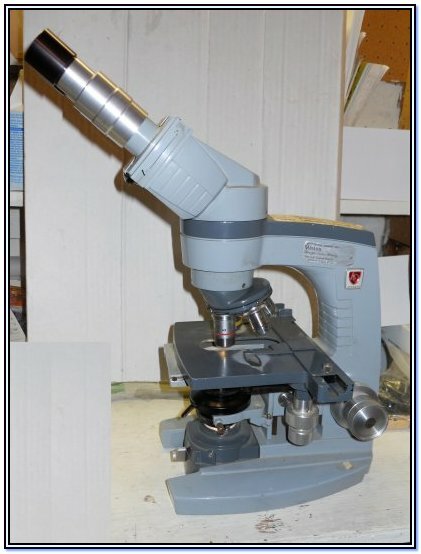 My equipment was an old AO clinical binocular microscope with a homemade mount for my Minolta SLR film camera. The polarizing filters were positioned with hand made friction fit mounts. I printed the best slides to Cibachrome paper at the local rental darkroom. The color saturation on these printed images was amazing. When the darkroom discontinued supporting the Cibachrome process I lost interest and moved on to other hobbies. 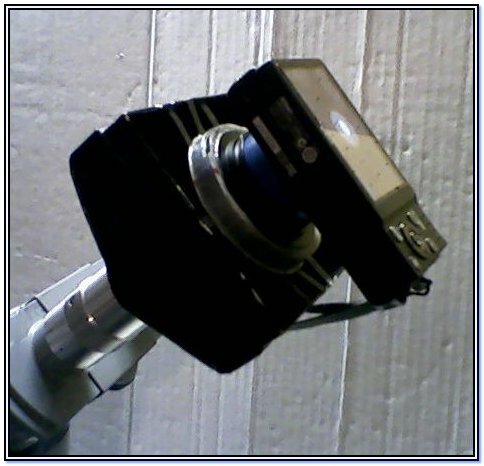 Now, years later, I still have the microscope equipment and also have a digital Nikon CoolPix S570 camera. I found a way to adapt my old Minolta adaptor to this new camera and soon was happily capturing still images. Below is a recent still image I captured with the digital setup shown above. The ease of digital color saturation and contrast control should bring a happy tear to most Cibachrome fans like me. I was watching sulfur crystals grow while waiting for the slide to cool for photos when it occured to me that the Nikon CoolPix has video capability! The camera does not have a removeable lense. I am able to avoid almost all vignetting by using the optical zoom feature. A small amount of extra zoom using the digital zoom feature removes the remaining vignetting and can be used to control cropping composition at the time of video capture. I found my first sulfur movie footage very moving and felt it really needed music to go with it. This video is 10 minutes long. Earlier versions were shorter but once I had settled on the ambient music, that I liked, I decided I wanted to use the full score. I prefer watching in full screen mode which brings up the higher resolution (480p) video. When I first captured sulfur crystals growing I knew I needed to set the video to music. But what song? What style? Years before I had an experience where I was driving at night on a long empty stretch of highway under a dark and star filled sky. On the radio was a station playing what I would call ambient space music. I recall feeling as if I was driving a starship through a tour of the Milky Way. I didn't want the drive or the music set to end. Years later watching these "other worldly" crystals I knew I wanted that style of music. I was unfamiliar with songs or artists of that venue so started a web-search for clips of music. There were several nice sounding ambient choices but one clip had a sound that really fit my taste for the microscopic crystals. It was then that I noticed the title of the song, "Microscopic" by Gas. How perfect was that ! Though this track is free I wanted the musician Mat Jarvis to see the video and confirm that it was OK to put on YouTube. Fortunately Mat not only liked the video, he also has video experience and provided many video pointers for me (a video newbie) via email. The final video shown above has many improvements over my earlier versions. Mat's constructive tips and perspectives provided the help I needed to progress on my learning curve. While this was a good start and has many interesting sections, it suffers from jerky tracking, crystals that sometimes grow too fast to track well, and too much use, on my part, with video special effects (FX) to do transitions. So the question became how to address these shortcomings to obtain improved videos. Some of the solutions I applied fall under the next four categories. The first step to more control was the choice of chemical as discussed below. I hope to address some of the others in a future article. Sulfur has a variety of interesting forms that are great for still shots. However for capturing video it can often crystallize too fast. An expensive solution would be a heat controlled stage. 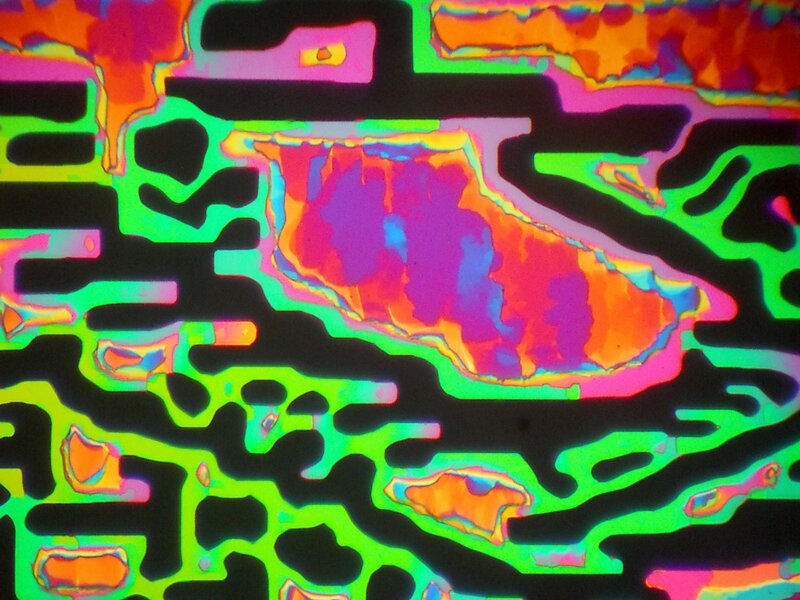 For a scope without that feature the next best choice for video is to choose a chemical that crystallizes slower. I settled on para-dichlorobenzene. However it did not provide the variety of crystal forms I wanted to see. The solution (pun intended) came in the form of DMSO. Adding trace amounts of DMSO provided the added variety while still maintaining a reasonable melting recrystallizing temperature. My theory of why the crystal forms vary more is that different areas of the slide have gradients in the concentrations of the two chemicals. It is interesting to note that DMSO by itself can be used for crystallization provided the stage is equipped with a chiller or one waits for a sufficiently cold day to do the work. I call the video "Crystals-Freeze-Thaw-Stretched"
.......... Topic for a future article. Check it out and support freeware authors. For questions contact the author, Dustin Brown, by email at the Email Us link at the top of the page.